Odds of saving marriage - slim. Farming expertise - patchy. Chances that it'll all be okay in the end - actually pretty good ... I wasn't enjoying the afternoon of 23 February even before I learnt that my husband was having an affair. The news of Jenny's husband's infidelity come... read full description below. 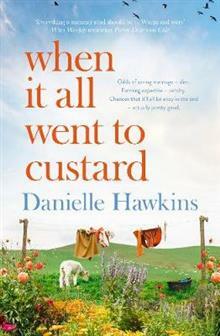 Bestselling NZ author Danielle Hawkins lives on a sheep and beef farm near Otorohanga with her husband and two children. She works part-time as a large animal vet, and writes when the kids are at school and she's not required for farming purposes. She is a keen gardener, an intermittently keen cook and an avid reader. Her other talents include memorising poetry, making bread and zapping flies with an electric fly swat. She tends to exaggerate to improve a story, with the result that her husband believes almost nothing she says.